WINCHESTER, Va. (Oct. 12, 2018) — Fred Findlay golf courses tend to play shorter than many modern designs. But short doesn’t always mean easy. 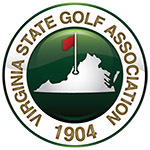 The players competing in the first round of the 42nd Virginia State Golf Association Mid-Amateur Championship Friday at Winchester Country Club learned that quickly. Despite playing a shade over 6,300 yards, Winchester still had plenty of bite, thanks to swirling winds and tight, small greens. It helps to have some local knowledge, and no one was better equipped to handle Winchester’s quirks Friday than WCC member Josh Riggleman, the defending club champion. Riggleman was the only player to post a score in the 60s on Friday, his 2-under 69 giving him a one-stroke lead over Alexandria’s Jimmy Delp heading into Saturday’s second round. After Saturday’s second round, the field will be cut the low 45 players and ties for Sunday’s third and final round of the 54-hole championship for players ages 25 and older. Lynchburg’s Lee Fisher was the third player to post a par-or-better score, touring Winchester’s layout at even-par 71. Defending champion Justin Young of Salem shot a 1-over 72 and is in fourth. For the first time, the Mid-Am’s first two rounds featured a shotgun start, and Riggleman began his day on the par-3 10th. He bogeyed Nos. 12 and 13 and was 2 over through his first six holes before breaking through for back-to-back birdies on 16 and 17. After the rough start, he settled in and played his final 12 holes at 4 under. The wind played a role in the higher scores Friday, Riggleman said. Delp began his round off No. 1 and got off to an uneven start, going bogey-birdie-bogey-birdie for his first four holes. He turned at even par and made a birdie on the par-4 11th before finishing his round with seven straight pars. Fisher, who tied for fifth at last year’s Mid-Amateur in Williamsburg, played in Riggleman’s group and got off to a hot start with birdies on three of his first seven holes. He was 3 under through 12 but leaked at the finish, playing his final six holes at 3 over to fall back to even for the day. He wasn’t fooled by Winchester’s lack of length. Young made four birdies but was undone by “two bad swings,” he said, leading to a pair of double bogeys that left him 1 over for the day. Still, at just three strokes back, the defending champ is very much still in the hunt heading to the weekend. 54-hole stroke play competition (18 holes per day), with the field being cut to the low 45 and ties for the final round. Open to VSGA members who will be at least 25 years of age holding an active GHIN number issued by a licensed VSGA Member Club in good standing.